And yes, you can also play games with it. In the early-to-mid 1960s, sci-fi television shows like The Jetsons and Lost In Space introduced America to the idea of personal, at-home robots (Rosey and “the Robot,” respectively) that also served a practical purpose. Rosey was primarily used for domestic chores, while “the Robot” helped the Robinson family with travel and security. And as the years went on, countless other science fiction series and movies further cemented the idea that it was only a matter of time before we’d all be using robots at home to solve real problems. Fifty years later, an extraordinary amount of technological progress has been made. But we still seem to be lacking the personal, at-home robots we were promised. Sure, AI-assistants like Alexa are common, but they lack the physical presence we’ve come to expect. And while there are plenty of amazing toy robots and robot companions available, most lack any practical value. 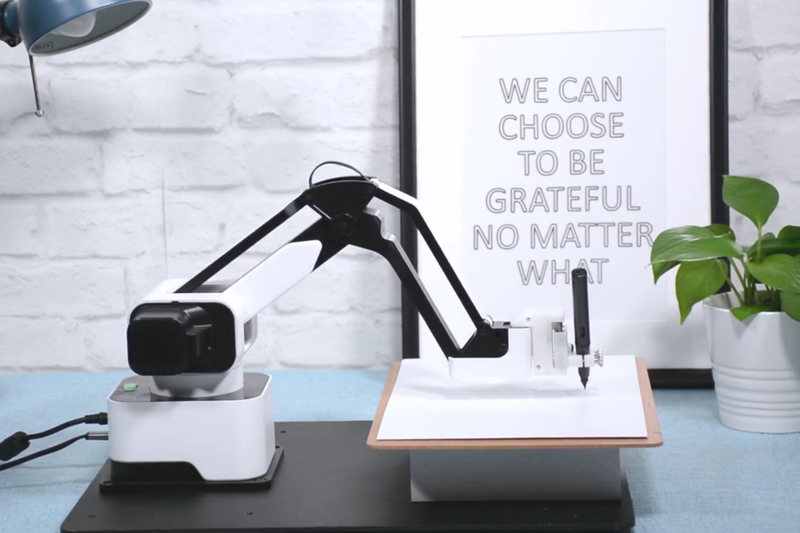 But a new Kickstarter campaign hopes to introduce the public to a robot that is both intelligent and practical. 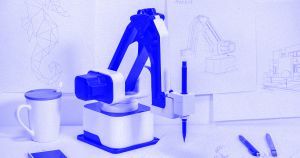 Known as Hexbot, it’s a versatile all-in-one robot arm that looks similar to the large, industrial machines you’d see in a factory. However, it’s small enough to fit on your desk top. Think of it as your own personal, miniaturized version of J.A.R.V.I.S. from the Iron Man films. As mentioned above, the Hexbot easily fits on your current desk top. But don’t underestimate it based on size. The device transforms your office into a high tech workspace and assembly line. Thanks to its innovative design, easy-to-swap interchangeable modules allow the Hexbot to complete numerous, useful tasks including – but not limited to – drawing, writing, laser engraving, and even 3D printing. An optional conveyor belt can also be added. It’s perfect for hobbyists, designers, and pretty much anyone who wants to bring their ideas to life. And it can even be used as a companion to play various games like chess and and checkers. The Hexbot’s patented decelerator design reduces the gap between gears, and allows for extremely precise repeatability. The Hexbot’s creators have also managed to significantly reduced motor noise to the point where you can literally take a nap beside it while it works. Best of all, Hexbot features a variety of intuitive and interactive control methods, including kid-friendly options like Blockly. And it comes with a 3.5-inch touchscreen, so you don’t even need to control it with a computer. So if you’re in the market for a robot that’s both extremely smart and incredibly practical, check out the Hexbot Kickstarter today.